Buy Aromamagic Sandalwood Oil - Bronchitis, chapped skin, depression, dry skin, laryngitis, leucorrhea, oily skin, scars, sensitive skin, stress, stretch marks. Calms Depressions, Nervous Tensions, redness and Infalamations. 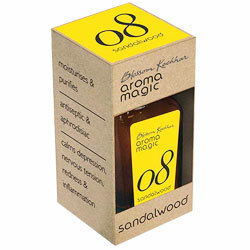 A sweet, woody scent which evokes a meditative atmosphere. Useful in states of anxiety and nervous tension. Can be used to treat chronic infections of the genito-urinary and pulmonary tract. In skin care one of the best oils for dry skin and acne. Powerful aphrodisiac.